At times I feel like the chaos is in control. Our life is chaos, our home is chaos, and our schedule is chaos. I know with the responsibilities of home and kids and jobs and family there will be chaos, so eliminating the chaos isn’t possible. However, organizing the chaos will help immensely. To begin, I turned to Pinterest and began to research Command Centers. The more I looked, the more I realized no one else’s command center will be perfect for my family. And no one else’s command center, including mine, will be perfect for your family. However, I learned several things which can help you find the perfect command center for your family. I discovered two main areas, and one minor area, where command centers can help your family. 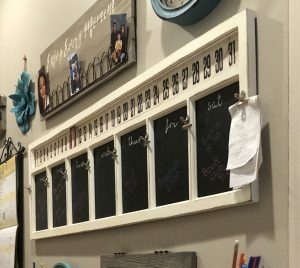 Command centers can definitely help you organize the chaos of your life, and I will show you how. Command centers can also definitely help you organize your clutter – especially, but not limited to, your paper clutter. 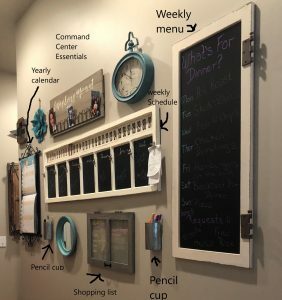 When done right, command centers can also add a decorative element to your home, although you should consider this a side benefit because if you design your command center with aesthetics as the main goal, it will probably fall short in the other 2 areas. When you are in full on chaos mode, it’s a struggle to even know where to begin. I believe the only place to begin is by organizing the chaos of your life. If you are constantly trying to get through the next have-to-do task on your list, you will never have time to accomplish the need-to-dos and you will especially never get around to the want-to-dos. So let’s begin with organizing the chaos of your life. The first item I added to organize our life is a yearly family calendar. 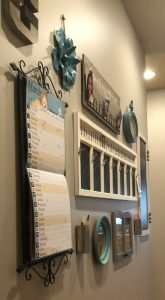 I have actually used this type of calendar for several years and knew how helpful they are, so this was the first item I added to my command center. While the yearly calendar is a must for me, I also need a more detailed weekly schedule. I love this one I found at Hobby Lobby. I made a few changes to the finish so that it would fit in better with my other components. You can see my updates here. 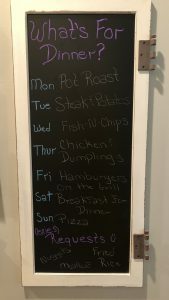 Meal planning is big for every family, so I turned this simple chalkboard from Hobby Lobby into a weekly family menu board. You can find all of the details here. One of my families favorite features is the “request” area at the bottom where anyone can write a suggestion for an upcoming meal. I wondered if it would always say, “candy, cookies, brownies” but so far only actual meal suggestions have been listed. 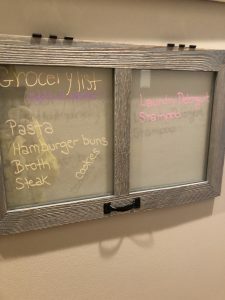 I knew having the shopping list near the menu board would help the entire family remember we might not have all desired items on hand and it has encouraged everyone to add to the list when they use the last of something. And who could resist writing on glass with these liquid chalk markers? Now to help the entire family use all of these organizational items, we need to make their use as easy as possible, and if you can manage to throw in a little fun – all the better. 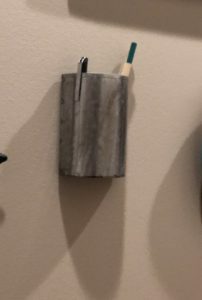 To make it easier to use, I added two of pen/pencil holders to the area. I also was lucky enough to have a long hallway to the garage (the entrance our family uses 95% of the time) where I can place my command center.. This location will ensure the command center is seen by each family member, multiple times per day. I understand that simply walking past all the schedules, plans, etc will not automatically ensure that everyone uses all the new tools at their disposal, but I am certain that if these items were not placed in such an accessible position, it would ensure that they are seldom, if ever, used. So while this placement doesn’t ensure 100% utilization, it certainly is the best set up for success. To complete the look, I added a few, but not too many, decorative items and a few pops of color. For my pops of color I went with a calming turquoise not only because it is a trendy color at the moment, but also because it is a color everyone in my family loves. And it looks great with the very neutral paint color I selected. I added a clock and a mirror from Hobby Lobby and a metal flower from Michaels, in the beautiful turquoise. In the next post we take on the task of Controlling the Chaos by controlling the clutter. I use the opposite side of my hallway to add organization for incoming mail, bills, coupons, and all the little items that so often end up on my kitchen counters. That complete post can be found here.